On August 11, 2012 Mitt Romney announced that his Vice-Presidential running mate would be Paul Ryan. And a quick check on Astro-Databank immediately revealed that Paul Ryan’s birth data came straight from his birth certificate. So in the 2012 US Presidential contest Barack Obama and Paul Ryan have AA-1 birth certificate data and Mitt Romney and Joe Biden have data that comes from memory. Sun in house 2 is the dominant planet. It’s conjunction Venus, trine Uranus, square Jupiter, parallel Neptune, square Saturn, parallel Venus, sesquisquare Pluto and sextile Mars. It has a net harmony of 1.62 harmodynes and aspects all the planets with above average power. They are Sun in 2, Neptune in 12, Venus in 2, Mars in 4 and Uranus in 10. Best planet is Venus in 2 – then Uranus, Neptune and ascendant. Worst planet is Saturn in 5 – then Jupiter, Mercury and Pluto. Dominant aspect is Neptune conjunction ascendant – then Sun conjunction Venus, Mercury parallel ascendant, Sun trine Uranus and Venus trine Uranus. Best aspect is Venus trine Uranus – then Sun trine Uranus, Mercury trine MC, Mars trine ascendant and Mars trine Neptune. Worst aspect is Mars opposition Uranus – then Mars opposition Pluto, Saturn sesquisquare MC and Moon opposition Saturn. Dominant House is 2 – then 10, 11, 1 and 12. Best house is 6 – then 2, 12, 10 and 11. Worst house is 5 – then 7, 1 and 3. Sun sign is Aquarius – I know – first decanate – Originality. Moon sign is Libra – I balance – third decanate – Expiation. And the ascendant (and Neptune) sign is Sagittarius – I see – first decanate – Devotion. The chart’s best markers are Venus, Libra, Venus trine Uranus and house 6. And its trouble spots are Saturn, Capricorn, Mars opposition Uranus and house 5. Major deficit is weak Moon (and he’s no family man). The Sun in house 2 (money) conciliates the worst aspect – Mars opposition Uranus – so the Mars-Uranus discord can find a harmonious outlet; but the Sun forms a T-square with Jupiter in 11 and Saturn in 5 so there are dents to his self-esteem. The Sun forms a very fortunate exact trine with Uranus in house 10. The Neptune-ascendant conjunction also conciliates the Mars-Uranus opposition, but the discomfort of the Mars-Pluto opposition has nowhere to go so the separations will be very stressful. There are 2 very powerful conjunction aspects, 5 trine aspects, 6 square aspects and 4 high-discord opposition aspects. The house 2-house 10 dominance maps a life shaped by financial and career interests and house 11 provides help from friends and supporters. The weak Moon has little connection with the everyday people and little interest in family life. The Sun is in the Originality decanate of Aquarius so he’s got an exceptional knowledge of human nature and a keen interest in education. He knows how to handle other people and tends to follow his own progressive ideas. The Moon is in the Expiation decanate of Libra so he’s got a keen mind, but can use his intellect and talents to keep others in ignorance and poverty in order to feather his own nest. This fatal flaw can only be avoided by living a moral life and rejecting corruption. [But Sun in house 2 (money) is sesquisquare (agitation) Pluto (corruption) in house 10.] And the ascendant and Neptune are in the Devotion decanate of Sagittarius so he’s very religious and can feel that he’s here to fulfill a definite mission. But he needs to rely on his own judgements because if he acts on the other person’s advice he’s sure to fail. Elbert Benjamine wrote: ‘The ability to exercise authority is dependent upon the intensity and volume of the Sun (in the birthchart). The vocation of a politician is that of directing the activities of others so he (or she) must have a sense of leadership and the power to dominate. But the electric energies generated by the activity of the Uranus thought-cells, while unstable and erratic, have a much higher voltage (than the Sun). They sweep others off their feet causing them to sponsor political programs and become wildly enthusiastic over ideas, which if submitted to calm Saturnine reason they would be quick to reject.’ And that’s what Paul Ryan can do with his very prominent Sun and Uranus. Paul Ryan and Mitt Romney have a powerful astrological connection. Ryan’s dominant Sun (at 9 Aquarius 01) and Romney’s dominant Venus (at 8 Aquarius 33) are within one degree of a conjunction aspect. The stand-out marker in Paul Ryan’s birthchart is Neptune conjunction ascendant. It’s in house 12 and 3 minutes from the ascendant degree so it could be in house 1. It’s the chart’s dominant aspect and indicates that Neptune – the planet of utopian idealism, great expectations, sensitivity, wild imaginings, deception, fantasy, dreams, schemes and lies – has a prominence (conjunction) influence on his personality and personal interests. You could say that the utopian thought-cell group in his unconscious mind is streaming an idealized self-image into his brain and conscious awareness whenever he thinks about himself. Now idealism – or the desire to seek or present a more perfect image – causes one person to exaggerate or lie about their achievements, while another resorts to criticizing and telling lies about other people. When it comes to Neptune the truth is hidden amidst the lies, deceptions and denials that deliberately confuse the issue and every one has a Neptune in their birthchart. The lies can be harmless, dangerous, subtle, blatant, black or white. And Neptune conjunction ascendant in Paul Ryan’s birthchart is the astrological marker that explains why he’s predisposed to misrepresent the facts, distort the truth, mis-remember and exaggerate personal achievement. Neptune in natal astrology is a tricky customer so here are some facts to dispel the fictions. He’s idealistic, visionary and imaginative, but somewhat starry-eyed and unrealistic. He’s lazy, a great pretender, a deception and an illusion. He’s a trickster, fraud and con artist. He’s melodramatic, romantic, fantastic, theatrical and fanciful – a mirage, a puzzle and a mystery. He’s a liar and a cheat and he’s vague and easily confused. He’s an altered state of consciousness – with or without drugs. And his billion dollar dreams allow him to escape the harsh realities of life. He plots and schemes and to get what he wants he’ll promise you anything and then he’ll break his promise. The fact is, when it comes to Neptune, nothing is quite what it seems. Paul Ryan is the first post modern candidate to run for Vice-President. His conditioning by experience has involved television, science, Ayn Rand, politics and Roman Catholicism. As a postmodernist he’s been taught to think that truth is relative and that he’s in charge of his life. He’s been taught to only accept facts and to trumpet his own self-importance. And his religious beliefs and scientific assumptions provide him with enough theological and scientific self-information to convince him that he’s the master of his fate. But chances are he has little genuine self-knowledge and the assumption that he – the rational thinker – is in control of the show is just an illusion. The progressed chart provides sensational self-information. As a bulletin board it details a list of current and upcoming astrological events: And some years there’s a flood and some years there’s a drought and in 2012 Paul Ryan is experiencing a drought. But that doesn’t mean the astrological activity in his chart has dried up completely. In his battle (Mars) to become Vice-President the progressions involving the Sun and the rulers of house 10 are the significant markers. The tenth house in his birthchart has 6.89 harmodynes and harmodynes sign for success and fortunate events. Its rulers are Uranus, Pluto, MC and Mercury. 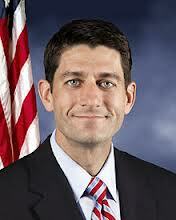 On November 6, 2012 there are no progressed aspects involving Pluto in Paul Ryan’s progressed chart. And there are no progressed aspects involving Mercury. And the only aspect involving the progressed Sun (at 3S13) is its intensity (parallel) aspect with birthchart Uranus. And that’s the only progressed aspect involving Uranus. It activates their birthchart trine and turns on the power (Sun) thought-cells and the unpredictable (Uranus) thought-cells in his unconscious mind. (On August 11, 2012, when the political spotlight turned on him, there was a strong build-up to Uranus – the planet of sudden events – in his progressed chart.) So there’s no doubt that Uranus – the planet of sudden elevations, faster than lightning developments and unpredictable outcomes – is currently playing a key role in his political life and career. Progressed MC (at 11S39) in his chart has moved to form intensity (parallel) aspects with progressed Jupiter (at 11S55) and progressed Saturn (at 11N25). Jupiter adds harmony to the tenth house and Saturn adds discord. And if the birth time is accurate progressed MC (at 00 Scorpio 16) in house 11 has moved to form growth (semisextile) aspects with birthchart Neptune, birthchart ascendant and progressed Neptune (at 00 Sagittarius 52R). And there’s more to these ‘growth’ progressions than first meets the eye. Progressed Neptune reversed its motion and turned retrograde in 2004 when he was 34 years old and it then formed a progressed conjunction aspect with its birthchart place and the ascendant. So the weak growth (semisextile) aspect involving the MC is stimulating the prominence (conjunction) aspects involving the ascendant and Neptune. It’s turning the Neptune thought-cells on and they’re streaming a non-stop program of idealistic, fantasy-dream images into his conscious awareness. These major Moon progressions can attract a sub-major Moon event or major events mapped by the MC-Neptune progression, the MC-ascendant progression, the Neptune-ascendant progression or the Neptune-Neptune progression. And during September and October 2012 Paul Ryan was destined to experience major events mapped by any of these aspects. But because the Neptune thought-cell group was the psychological hot-spot the events, whether beneficial and good or disastrous and bad, would have been replayed over and over again by a runaway imagination till in the end whatever he imagined should have been discounted by at least 90%. There are three other very powerful progressions in his chart to consider. The dominant aspect during 2012 has been progressed Venus (at 13 Aries) in house 4 moving to form a prominence (conjunction) aspect with birthchart Mars so he’s running on adrenalin and testosterone. The haste, energetic effort and social strife the aspect maps doesn’t directly affect house 10, but Mars is involved in the worst aspect in the chart – Mars opposition Uranus – and Uranus is in the tenth house. Progressed Jupiter (at 5 Scorpio 16R) – planet of patronage and support in house 11 (Congress) – has turned retrograde and formed a prominence (conjunction) aspect with its birthchart position; and progressed Saturn (at 5 Taurus 59) – planet of loss and disappointment in house 5 – has moved to form a high-discord separation (opposition) aspect with birthchart and progressed Jupiter. And progressed Mars (at 4 Taurus 20) – planet of strife and conflict in house 5 – has also moved to form a high-discord separation (opposition) aspect with birthchart and progressed Jupiter. These Mars-Jupiter oppositions are recent arrivals. Progressed Mars opposition birthchart Jupiter started on September 22, 2012 and progressed Mars opposition progressed Jupiter started on October 6, 2012. They map a temporary aggressive-religious thought-compound in his unconscious mind that’s inclined to cause the life-matters ruled by house 5 and house 11 to separate. But astrological events mapped in the progressed chart should not be considered inevitable. By November 6 all the progressed aspects involving the major progressed Moon and Neptune have finished and the major Moon in house 7 has moved to form a (growth) semisextile aspect with birthchart Saturn in house 5. This aspect can attract a sub-major Saturn event or a major event mapped by progressed Saturn opposition birthchart Jupiter or progressed MC parallel progressed Saturn. Any progressed aspect involving Saturn attracts work, responsibility, economy or loss. It’s generally agreed by commentators that Paul Ryan can talk the rhetoric and enthuse the listening audience. In his chart Leo is on the ninth house cusp (public speaking) so when he’s giving a speech the Sun shines. Birthchart Sun is in Aquarius so he’s very good at debating and it’s presumed that he’ll win the debate with Joe Biden on October 11. But Joe could surprise. Because they have the same ascendant sign their charts have many similarities and Joe has Leo on the ninth house cusp too. 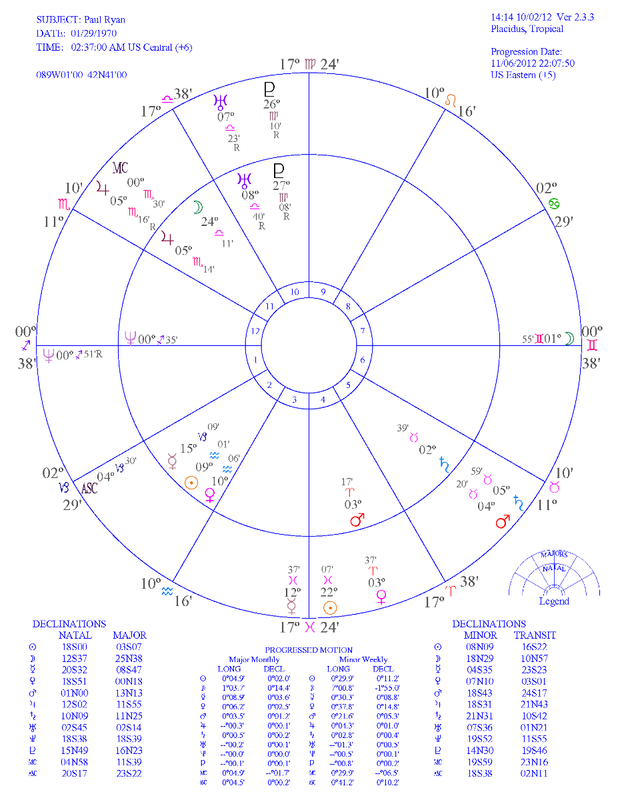 Birthchart Sun is in emotional Scorpio, but on October 11 his progressed Sun has moved to 8 Aquarius 38 and it’s conjunction Paul Ryan’s birthchart Sun at 9 Aquarius 01. And with progressed Mercury (at 28 Capricorn 24R) in his chart now forming an opportunity (sextile) aspect with birthchart Sun Joe Biden has the opportunity to shine too. Foreign policy (house 7) will be a hot topic. Ryan’s got progressed Moon in house 7 opposition progressed Neptune and the cusp ruler, Mercury, is not stimulated by progression. 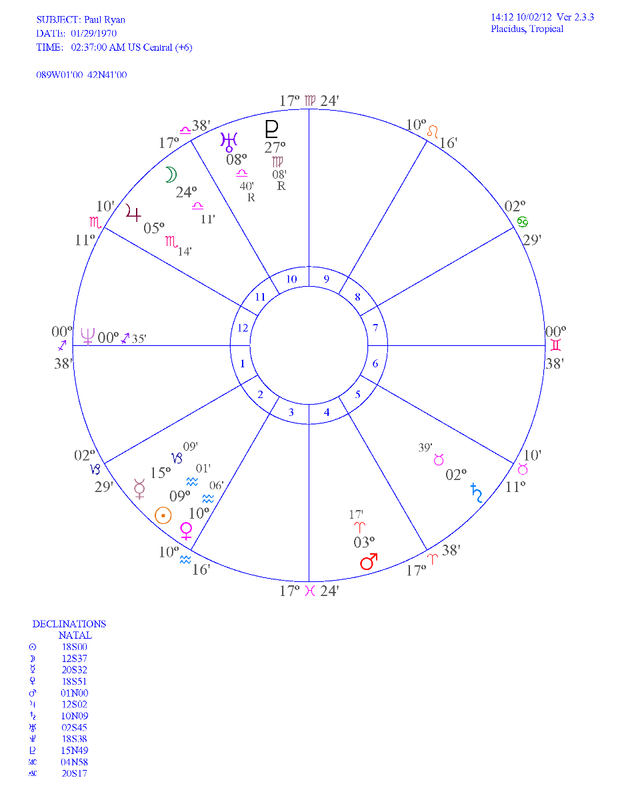 Biden’s got Saturn there (and maybe Uranus) with Mercury the cusp ruler, and progressed Mercury is sextile birthchart Sun.